The Halsey Institute of Contemporary Art presents an evening with photographer and visual ecologist Martha A. Strawn on Tuesday, January 31, 2017 at 6:00 PM. Free and open to the public. Martha A. Strawn will deliver a lecture on her recent publication, Across the Threshold of India: Art, Women, and Culture, which documents the creation and significance of threshold diagrams in Indian history and culture. A tradition practiced by Indian women for thousands of years, the diagrams represent highly sophisticated mathematical and cosmological underpinnings that have been handed down from one generation of women to the next. As India has modernized and rapidly become more urban, however, more Indian women have acquired more complicated lives, allowing less time to continue the practice of threshold drawing and relying, increasingly, on homogenized pattern books. And so a longstanding and critically important expression of Indian life, religion, and culture is becoming less common to the point the tradition is threatened. Across the Threshold of India combines Martha Strawn’s unforgettable photographs—most of which are in the permanent collection of the Indira Gandhi National Centre for the Arts, the nation’s foremost research center for Indian culture and art—with the most recent scholarship on the history and art of the threshold drawings. This stunning work of visual ecology provides insight in to one of India’s and the world’s longest and least-known religious practices: the art of sanctifying space through the creation of threshold diagrams. In 1996, the Halsey Institute of Contemporary Art displayed the exhibition upon which this book is based. Members of Charleston’s very active Indian community contributed by creating rangoli at all entrances to the building while the exhibition was on view, and provided Indian food, music, and dance at the opening reception. 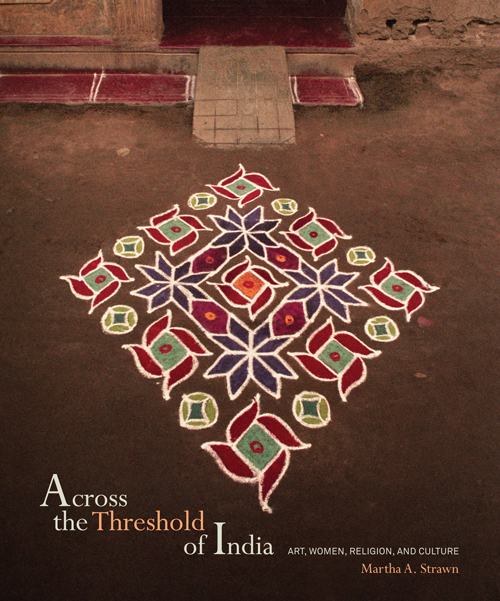 The publication of Across the Threshold of India has been worth the wait. Director and Chief Curator Mark Sloan contributed an essay to the volume, which was co-published by the Halsey Institute with George F. Thompson Publishing. In addition, Martha Strawn has selected one of the images from the book to be made available as part of the Halsey’s Patron Print Program. Martha Strawn will speak on the years of research and photography presented in Across the Threshold of India in Simons Center Room 309. A book signing and reception in the Halsey Institute galleries will follow.